After kicking the year off with a mini-rally, gold was holding steady at around $1,225 an ounce in New York on Thursday. Gold showed little reaction on Thursday to expectations of a rate hike in the US much sooner than previously expected as good news about the economy pours in and Fed minutes show consensus on the need to slow down the dollar printing presses. Predictions for the gold price in 2014 by investment and bullion banks don't vary much in that the vast majority predict a decline this year. In fact as forecasts dribble in, it seems analysts are getting more bearish by the week. Latest to call for a double digit decline in 2014 after last years hammering is Bank of America Merrill Lynch. The investment bank now sees gold averaging $1,150 this year, compared to 2013's average of $1,410, a more than 18% decline. MarketWatch quotes BofA Merrill Lynch strategist Michael Widmer as saying gold could even trade below this levels should last year's record setting investor outflows for the sector continue. "If investors stopped selling gold, prices could stabilize around $1,200/oz. Yet, this is not our base case and a more likely scenario is for investors to continue reducing their exposure. Our model suggest that this could take prices down to $1,000/oz." Holdings of the world’s largest gold ETF – SPDR Gold Shares (NYSEARCA:GLD) – has dropped 3.6 tonnes this year as of Thursday after a 45 tonne decline in December. At 793.1 tonnes GLD holdings are at the lowest level since January 2009. BofA Merrill Lynch also cut its forecast for silver by 21% to $18.38 an ounce for the year. Silver futures were last changing hands for $19.50 an ounce after plummeting 36% last year. The precious metal averaged a shade under $24 last year. BofA Merrill Lynch joins London-based Barclays in issuing a bearish forecast. The Economic Times quotes Barclays analyst Suki Cooper as saying "from both macroeconomic and underlying fundamental perspectives, gold is likely to struggle to find supportive catalysts in 2014." Barclays sees gold averaging $1,205 – 14.5% below last year's average – with a high of $1,375 and a low of $1,050. Barclays sees silver at $19 an ounce this year. Swiss financial group MKS Group is more upbeat about the prospects for gold predicting highs of $1,350 in the first half of the year, before a weakening to a low of $1,120 towards the end of the year as US rates begin to tick up and global growth picks up. MKS's average for the year is pegged at $1,262, down 10% from last year. The official sector has been a net buyer for several years, the agreement may possibly not to be renewed or the signatories may decide to reduce the selling quotas. 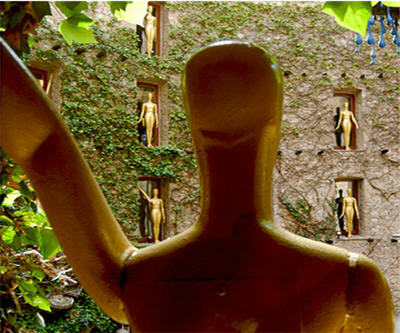 Picture of gold mannequins from Dali-Theatre Museum in Barcelona by Chirag D Shah.